Sumangali prarthanai | Mangili Pondugal is always performed in all Brahmin family. I wanted to write a detailed post on this for a long time but this time i happened to click few pictures as we did sumangali prarthanai in my in laws place. Though it was bit tough for me run around with camera, my husband took the entire responsibility to click the pictures . My mother in law too was very cooperative and explained me all the procedures in every step which was easy for us to take the pictures. But still i won't say the pictures are very explanatory. But for us to host the function and take the pictures is a bit tough task. But i make it sure that i will explain about this pooja, so that it will be useful for the next generation to follow. More than that it will be useful for me when i do it during my kids wedding . The tradition behind performing the pooja is to seek the blessings from the ladies who passed away in the family as sumangalis. The procedure may slightly vary from each family but 90 % it is the same. We , my in laws side hail from North Arcot District of Tamilnadu, follow this method and in my mom's house, they hail from Tanjore District, it was almost the same but slight variance will be there. Let me explain about this according to my knowledge. If anything i missed out or any doubts please feel free to leave your comments. This is an elaborate post. Sumangali Prarthanai is made in many families every year in remembrance of the ladies who passed away in the family as sumangali. Sumangali is nothing but a married women whose husband is alive and if she passes away before her husband she is considered as blessed in Brahmin Tradition. Generally we do sumangali prarthanai before wedding, poonal ,seemandham or grahapravsesham too. Sometimes they pray to the ancestors and wish for anything and do this also. If we didn't have any occasion at home for 3-4 years, we just casually do this sumangali prarthanai just to seek the blessings for the entire family. That's why this time we did at our home. Generally 5or 7 sumangalis and 2 Kanya Kids(girls who didn't attain puberty) will be invited for the pooja. As such no elaborate pooja will there for this function. But unlike other functions, this is completely a ladies function and the pondugals who are invited along with the kanyas will be served the food first. Generally if a daughter is getting married in the girl's side they will do it compulsorily before the wedding and keeping the daughter who is going to get married as one of the pondugal. But in the boy's house also they do the sumangali prarthanai but they can either do it before the wedding with their family members or they can either do it once the daughter in law comes into the house. But a daughter in law cannot be a pondugal. since we are the host, we cannot sit as pondugal. But i have seen in few families, according to their tradition, they keep daughter-in law also as one of the pondugal. But generally it is not the case. Generally this cannot be performed twice a year. Only once a year only we can do this. That too if there are 3 brothers in the family, if one brother is performing this year as he wish to do, generally for the whole year rest of the brothers should not perform the pooja though they have any poonal or seemandhan . It is considered as the blessings will continue to be there the entire year. Also the daughters of the family are generally invited as pondugals. But they don't have daughter, we can always call people from our relative circle, who are not our Pangalis. Any Sumangali is eligible to sit for pondugal provided she should not have periods , not even 4th day is allowed. Also if anyone in the pondugal's family passed away and still the Varushaptigam is not done, she is not eligible to come. Coming to the procedure, we make a list of mamis to invite and the kanya girls too. Mostly all of them will be ready to come as this is considered as a blessed opportunity. But sometimes there may be some emergencies or last minute drop out too, so we always keep someone in reserve to compensate this. The before day we go and give turmeric, sesame oil , shikakai and mehandhi (marudhani) to the ladies who are invited for pondugal. The tradition is they have to apply mehendi and take oil bath and also apply turmeric while taking bath which is considered very auspicious. They will come home the next day by taking oil bath and wear a 9 yards madi sari (the saree will be washed and dried up inside the house and once it is dried we are not supposed to touch them with hands) Generally we have ropes tied on the top near the sealing and the madi thunis will be put for drying using a stick. It is a technique which comes by practise and my mother in law is an expert in that. I can do for small things like towel, the blouse and all but saree is tough for me. So the pondugal will wear the madi pudavai and come to the host's house. Sometimes if they are coming from nearby towns, they will come and take bath at our house only. In that case since it is planned in advance, they will bring their own madi blouse and we will prepare a madi saree for her and keep it ready. This time most of the pondugal invited are from my native place in North Arcot district. So they all came around 7 in the morning and took bath at our place. We kept the sarees for all of them and they all are ready by 9 am. Generally they are not supposed to eat any solid food before the pooja. So only coffee will be given. If needed one more round of coffee or tea can be given. Even the host also is not supposed to eat any solid food. We put big Maa kolams in front of the house and also tie maa ilai thoranam. 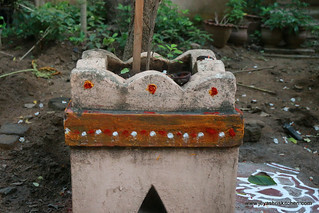 Since we have a Thulasi maadam at home, we put kolam in front of that too and decorated that with kumkum . We invite the pondugal by giving manjal, kumkumam to them and give flowers to keep it on their hair. The Sumangali prarthanai is not performed on Tuesdays and saturdays. Also The tamil month of Aadi and Margazhi is not auspicious to do this function. Also ashtami, navami, pradamai, amavasai and pournami is not considered auspicious to do this. 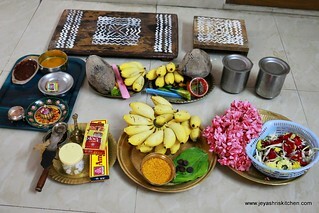 Any Muhurtham day will be very good and also the good time to do this pooja on the day is also fixed in advanced. Raghu kalam and emagandam is not good and so the good time will be seen considering these factors. The function doesn't have any elaborate procedure. Once the cooking is over and the time which is fixed in advance as auspicious neivedhyam will be done and we will start serving the food. 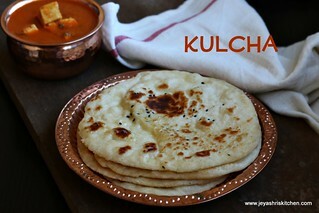 Before we serve the food we need to prepare for the swami ilai. Among all the pondugals one of them generally who is very senior, will be given the 9 yards saree which we keep in the pooja. That too the saree along with the blouse bit will be soaked in water,early in the morning and kept for drying in the terrace and before the pooja it will get dried and we fold this and keep it. Rest of them will be given normal 6yards saree or a simple blouse piece according to their capacity. Both my mom and mil always gives saree for all the pondugals. 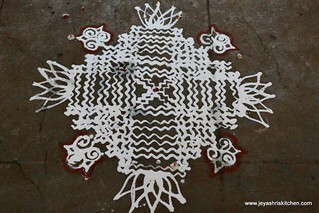 We put 2 small kolams nearer and place two manaiplagais on this and put maa kolam on this. 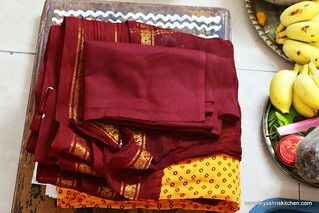 when it is completely dry, fold the saree and place it along with the blouse on the manai palagai. the nuni side of the saree should be kept facing North direction. The dress of the kanya girl is also kept on the second manai palagai. The vethalai, paaku, manjal, poo, small mirror, comb, bangles all should be kept on both the dress. A small garland(maalai) is also tied around it. We also put our jewellery like chain or necklace and bangle on the pudadavi . 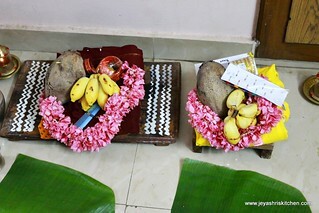 Two banana leaves are put in front of the manai and we call them as swami ilai. The leaves will be nicely washed and pat dried. Also all the banana leaves will be put for the pondugal and kanya kid too. 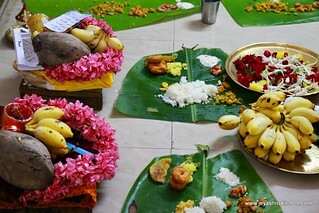 All the pondugal will be invited formally and asked to sit in front of the banana leaf. In my mom's side they all will be standing out of the house and all the ladies in the host's family will be calling the name of the ancestors who passed away sumangali and invite the pondugal. The tradition behind this is the pondugal who are invited are considered as our ancestors. My inlaws house they don't have this tradition. They just formally call all of them and come to sit and tell them to relaxedly sit and have the food. 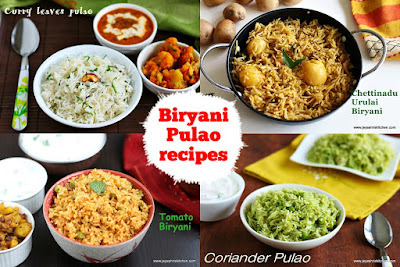 All the food before serving will be served on the pudavai ilai first and then to the all the pondugal . So all the first time serving will start from the Pudavai ilai. The menu will start with Paruppu payasam, sweet pachadi, thayir pachadi, Kosumalli, raw banana curry, paruppu usili, thogayal, paruppu vadai, poli, variety rice(coconut rice|lemon rice|puliyodarai) , plain rice, poosanikkai pitlai, Kalyana rasam, Thani kootu ,yogurt and ghee. We also make neer mor and panagam too. 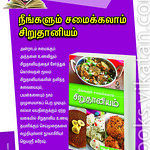 A mix of sukku podi and jaggery also will be kept, which is given to all after eating to enhance digestion. Once the food is served, the elder sumangali lady in the family, either the mother in law or the elder daughter in law will do neivedhyam and show karpooram to the pudavai ilai and all the people from the host's family will put flowers on the pudavai ilai and do namaskarams to that. Generally while putting flowers elders will tell us to pray for a wish to happen and then do it. It is strongly believed that the wishes made during this time will be fulfilled. Later the food served on the pudavai ilai will be shared among the ladies in the host's house (that is by me, my co sistersand my mother in law). Once the pondugal will heartily finish the food, we will clean the place. Generally the hosts are supposed to clean the place and not to be done by maid servants. Once they finish the food and come they are asked to sit on the floor in a mat. We have to apply turmeric and nalangu manjal for all of them. They will be given sukku vellam, panagam and Neer mor. Manjal kumkumam along with the vethalai, paaku, kannadi, seepu,poo, saree or blouse piece, a coin will be given to all of them. They won't take it in the hands instead will get this in their saree thalappu. All the family members including elders will do namaskaram to the Pondugal and the kanya kids. They will put the Akshadai (holy yellow rice) bless the family heartily. The lady who is given the saree which is kept in the pudavai ilai will generally wear the saree before she leaves home. Though the procedure may look elaborate, this is a half a day procedure. 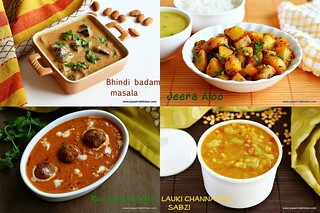 Now a days we put cook who will come and cook for this special occasion. So they will take care of the cutting the veggies till cooking, even some of them will serve and clean the kitchen after all work is done and go. This time in December 2014 we had Sumangali prarthanai at my mil's place and it was a very memorable event and had a great time with all relatives too. I thoroughly enjoyed writing this elaborate post. Thank you so much for reading this patiently. that's the sprit plus it's good to see the non food. Post in interesting way throughly enjoyed. We did this when my daughter got married in November. We did the cooking ourselves. You have explained all the steps so well. Since I'm from north arcot we do the same way but in my in laws place they keep the Saree as kosavam. Can someone or you can explain how it needs to be kept. A pic on the same would be of great help. 1. Pregnant sumangalis are not generally considered as pondugals. 2. Once the oil and shikakai are given to the sumangalis, the function should not be called-off for whatsoever is the reason. 3. Like you mentioned, we also don’t invite sumangalis who are married in the same gothram like ours, as pondugals. 4. If the function is to conducted on the next day of the sradham (yearly ceremony/devas am) of the deceased sumangali, then that day is still good or auspiciousness of that day need not be seen separately. Is This tradition followed only by tamil brahmins? Excellent effort...wonderful pics and useful info....these are the legacies we leave behind for the future generation to come. So very useful for ladies like me who are still in the learning process for many a thing!!! We do the sumangali prarthanai with 100% sincerity..diligence . When we concentrate deeoly we get signs of how the even would be for which we are doing this or how the future would be or what got left out. My in laws, from madurai, call it panai pudavai( pot saree) and its passed from 1generation to other and the eldest of the family will possess it. Nice write up. It was like attending my house function while reading it. We had the function this past summer as it was after my FIL's sadhabhishegam. I am the elder DIL and I had to do all the nalangu and place the food on elai. We too do the kosuvam for the 9 yards and place a vethalai as the face and decorate with earrings and necklace with bangles. We gave this saree to my eldest SIL. Since we had a cook, we could fully enjoy the process with the rest of the family. Thanks for reminding all this happiness once again. Informative and Excellent post. Thank you for the great effort for putting up all the details neatly. Good efforts to complie this Post.. another point to add - there should be no black print/design in the sari/pavadai that we offer to the pondugal/kanya ponnu. Good post Jeyashri. 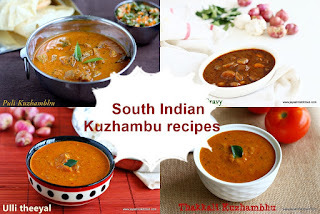 Is there a tradition of making Thani Kootu for pondugal in your family ? 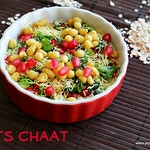 If you get the recipe pls post the recipe for "Thani Kootu"
Awesome. Future generations don't know these formalities. Good. I'm from United States. I'm your fan Jeyashri. Such a useful post Jayashree. 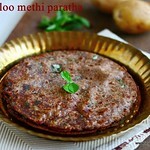 Thani Kootu is the important dish in Sumangali Prarthanai. You have missed it. But still I love you alot. Very nicely mentioned d procedure. Good job. Keep going. Your article is very detailed. Thanks for posting it. I know every house has a few variations. But you have captured the main points well. Kudos. So nice to read and refresh our memories. Especially when the earlier generation who always guided us are not available. We need to look for service minded people like you to help us keep up our tradition. Thanks and god bless you. Whether for want of any other suitable day, can Sumangali prarthana be conducted in the Marriage Hall of the bride, when Vratham for the groom and Jathakarma for the bride is fixed ,being next early morning-muhoortham is to be performed ? Excellent post.Actually we are planning to perform a sumangali prarthanai next month.I have only vague knowledge about the procedures.Your blog is a timely help.Tanks for ur info. Thank u jeya..Am a non brahmin married to a brahmin. This was an amazing read. We are going to have aumangali parthanai this Sunday 7 Feb 16 and have all the details in my finger tip.. Thanks again. Hi, puberty girls which are not married yet can do they join sumangali pooja. They can come but can not sit as a pondugal. But if the sumangali prarthanai is performed before the girl's marriage, she can sit. 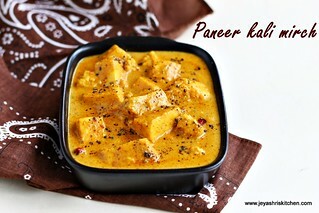 Hi jayashree. Even though i know all these procedures...i enjoyed reading ur post. God bless u..
Generally it is the elder athai in the family, that is dad's sister, but no rule like that too. As our tradition always give first preference to the dad's side mostly it is like that only. Hi J, your post is really informative. my issue is lil different. my MIL never performed it saying that her Orpadi (elder SIL) is doing so in a fly its done in 1 hse only. but as far im told it has to be done in ur hse if u r not living together. in my sons poonal also we didnt do bcoz of her, now recently when i mentioned abt it she said you can do that, though she didnt do for my hubby nd my elder BIL marriage also. my BIL nd FIL is no more. my mom died as Sumangali. J i want to perform this 1st fr my sons poonal nd next when my daughter marriage will come. can you pls ask elders nd tell me as i can start this ritual. i know the procedures though living in Jharkhand. ill be very grateful for this help. I need some clarification. The bride who is getting married will also be considered as one of the pondugal. In that case including bride should we have to count 7+1? Many thanks for narrating the procedure for conducting SUMANGALI PRARTHANAI.Though we have been doing so since many years, your putting in writing the same with relevant photos made it very clear for easy understanding.Many Thanks again.Mrs.Srojam Sivasubramaniam. Sr.citizen,Coimbatore. Thank you so much aunty. Thanks for your time to write a feedback to me. I don't know, never seen a situation like this. IS THERE ANY RULE THAT IN THE MONTH OF MARGHAZI, IYEPASI [BETWEEN OCT/PART NOV/PART DECEMBER]THIS PRATHANAE [SUMANGALI PRATHANAE/MANGALI PONDUGAL] SHOULD BE PERFORMED - IF SO, IS THERE ANY RELAXATION? No nothing like that, Generally it is not done in Margazhi and aadi maasam. Otherwise you can do it any month on some auspicious day. Thanks for making such wonderful effort in compilation of the tradition. It will probably help the younger generation. 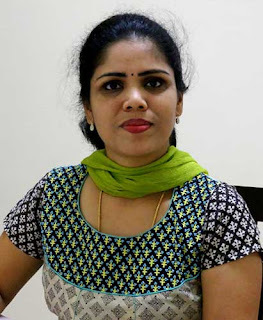 Can Sumangali prarthanai be done on a Saturday, if Sunday is the Poonal? Also, can it be done in the poonal hall, as my in laws are in a different city and they said it was ok. I have my chinna maamanaar in the place where poonal is taking place, but didnt't want to impose on them. You can do it on Friday. Generally Saturday is not a good day for doing Sumangali prarthanai, according to elders. Personally if you ask me, if you do things whole heartedly, you can perform it on any day. Just keep faith and move on. Elders reading this please excuse me, i am not hurting anybody's sentiment. Just me personal opinion. That was a very clear description of sumangali prathanai event that I have grown up watching. I want to perform this prior to my daughter's wedding later this year. I am hitting a brick wall in understanding the significance of this event. My mother passed away as a sumangali and my mother in law was a widow when she passed away. Ideally I would like to see blessings from both and I am sure that both will shower abundant blessing to our daughter and our family. So my question is why is the event restricted to sumangali's. Can I ask an elder who is a widow to sit at the pooja. I understand that she must not be offered Kumkum and the likes- but can I simply offer them fruits and seek blessings. I am planning to slightly change the procedure and invite elders (both sumagali's and widowed women)and am confident that all will shower blessings equitably. Could someone please sign post me in the direction of ancient text/literature where this procedure is described? All comments will be welcomed and no offence will be take. Thanks for the comment.I know this is quite a sensitive question and at this age for me it is difficult to answer.Some rituals elders keep it as a tradition and we never know or questioned them, though we have difference of opinion. Even my mom is a widow and for my marriage Sumangali prarthanai or during my son's upanayanam, she is allowed to sit, but genuinely from the heart she is one of the best well wisher for me. Who else can think for me than my own mother. But all the seer given by the widowed mom to the daughter is always acceptable. I am not blaming the system but it is like that. But if you want to bring in a change and boldly do it,please do it and be the torch bearer. Again it is a very sensitive issue for me write openly in my website.I generally don't argue with people and just abide by the traditions followed by the family. Also i don't know what is mentioned in the scriptures or significance of the event and all. You are much more elder than me and i am sure you can take a better decision, which you feel is right. No offence to any elders reading this. Thank you. Thank you for such information at time we forget by reading once again we recollect it. Very nicely described about sumangali prarthanai.In our family we regularly do this. Can you please clarify whether ellu urundai is served for sumangali prarthanai..it is in practice in my MIL house who are from Tirunelveli. In my mom's house ellu urundai is served only for srardham. I have to perform sumangali prarthanai for my son's marriage. Hi i just saw your mail to regarding this, if it is a tradition in your in laws house follow that only. Even we have the tradition of making pottukadalai paruppu thengai for all auspicious occasion in my in laws house where as my mom's side it is made for not auspicious occasions. But we follow mil's side tradition only. My mom gives seer with pottukadalai paruppu thengai only. when we have to eat in swami ellai after other pondugal eat and after taking the podhavai from there.